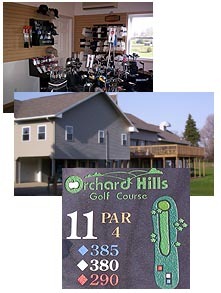 Orchard Hills Golf Course and Banquet Center offers 27 holes of golf, a banquet facility with a beautiful view from the balcony overlooking the golf course, a driving range and a complete pro shop. If you are planning a wedding, reunion or company outing, our banquet facilities offer a wide variety of menu choices. Please refer to the banquet center page for more information on our catering menu, policies and information. The golf and banquet complex is very conveniently located halfway between Grand Rapids and Kalamazoo just two miles off US 131 in Shelbyville, Michigan. If you need directions a printable map is available here. Thank you for visiting our web site, we hope you have found the information you are looking for. If you need more information please call us or fill out the contact us form and we will be happy to answer any additional questions you may have about our facilities.